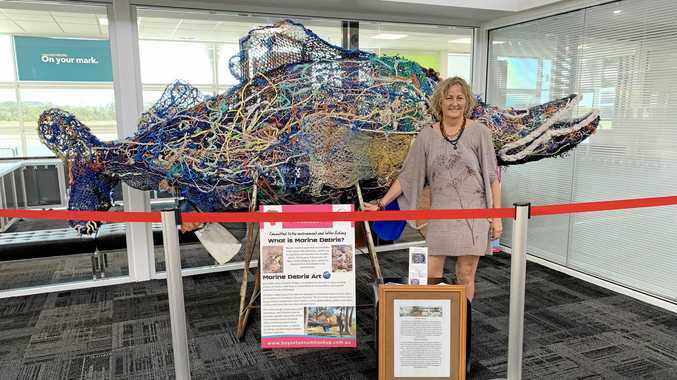 THE Gladstone Airport has become the temporary home for the iconic barramundi marine debris sculpture created by local artist Christine Holden. Ms Holden's barramundi sculpture will be on show in the airport terminal in the lead-up to Easter, when it will journey on to be a part of the Gladstone Harbour Festival celebrations. 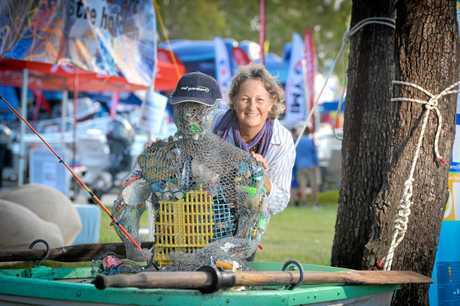 On the back of Clean Up Australia Day, Ms Holden has a whole new treasure trove of marine debris collected from Lilley's Beach at Tannum Sands, which she will put to good use by creating more 'ethical art' in the coming months. Her barramundi caught the eye of a number of visitors to the region when it was being unloaded at the airport last week and has driven some new followers to her Instagram (@ethical.art) page already. Gladstone Airport Corporation chief executive officer Colin Fort said Ms Holden's art installation was a vibrant way to celebrate the art culture of the Gladstone region. "This is a great talking piece, as it certainly catches your eye," Mr Fort said. "We are about to install artwork tracking on some of the main walls throughout the airport terminal so that we can showcase some of the amazing artworks generated across the region. "We've been working hard to better utilise the airport terminal as a way of showcasing what Gladstone region has to offer. "We want the terminal to be a place where holidays begin. "The recent upgrade of our website, as well as installation of hero images on walls and windows throughout the terminal is all part of the plan to capture the imagination of visitors to our region. "We have more in store, so watch this space."